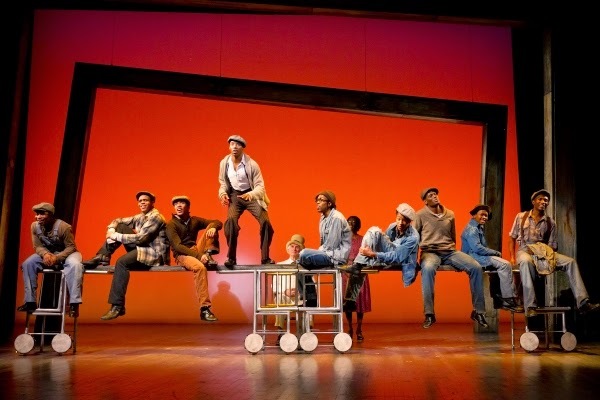 "Ms. Stroman offers some of her most effortlessly vibrant work since The Producers, exploiting a minimal set by Beowulf Boritt... a series of girdered prosceniums and an array of silver-painted chairs to conjure the airy freedom of train travel, the claustrophobic terrors of prison and the raucous atmosphere of the courtrooms." 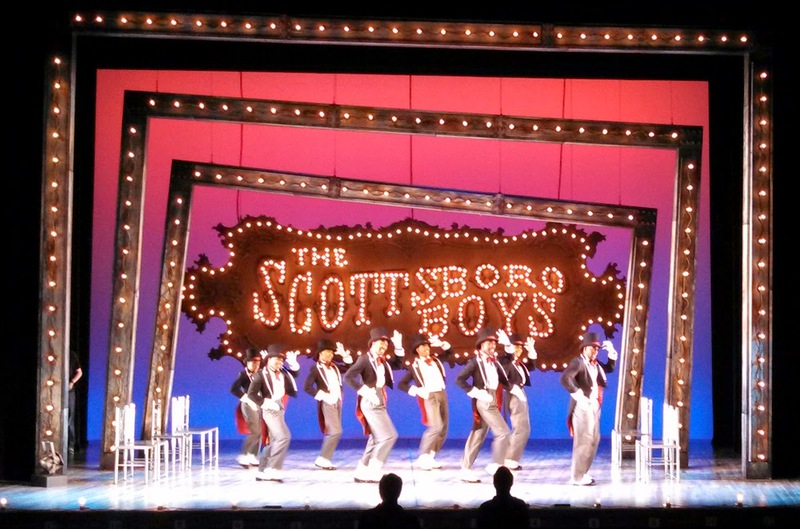 "The production design maintains the musical's tight aesthetic. Beowulf Boritt's sets and Ken Billington's lighting insinuate just enough flash into the attractive severity to keep us mindful that we're watching a stage performance within a stage performance." "Stroman, with set designer Beowulf Boritt, has used little scenery, choosing instead a collection of silver chairs that interlock to create everything from a train to a jail to a courtroom to a bus. The fact that the nine accused men construct each adds to the irony." "Minimal set by Beowulf Boritt works perfectly within the concept"
"The always clever Beowulf Boritt doesn't have much of a budget, so he opts for a bunch of chairs and places them in intriguing positions." 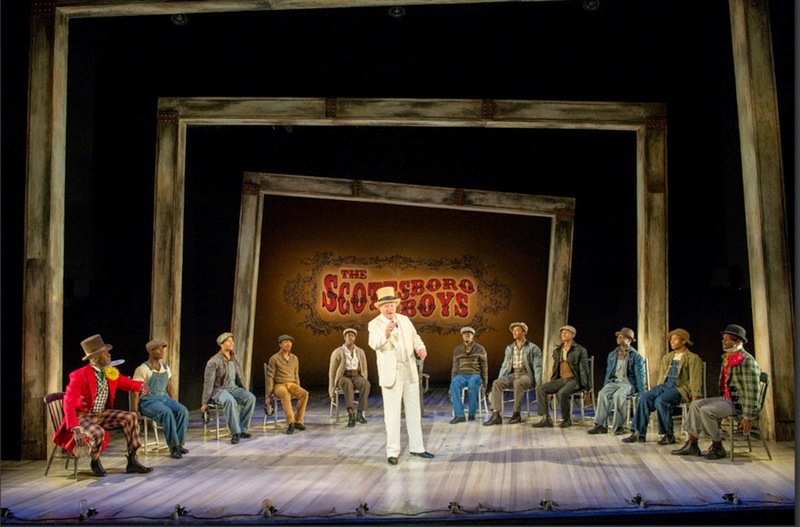 "The Scottsboro Boys is enhanced brilliantly through the fluency of Beowulf Boritt's spare setting of skewed prosceniums." "Stroman seems to know exactly when pyrotechnics are required, she has also obtained fine work from her designers. Beowulf Borrit's setting, a series of ever-more precariously tipping prosceniums"
"The production, guided with elegant simplicity by Stroman, unfolds with rapid fluidity on a stage that scenic designer Beowulf Boritt frames with skewed proscenium arches that echo the show's off-kilter approach to the story. The other elements of his design are a dozen chairs and a few boards, which are inventively rearranged to represent a variety of locations." 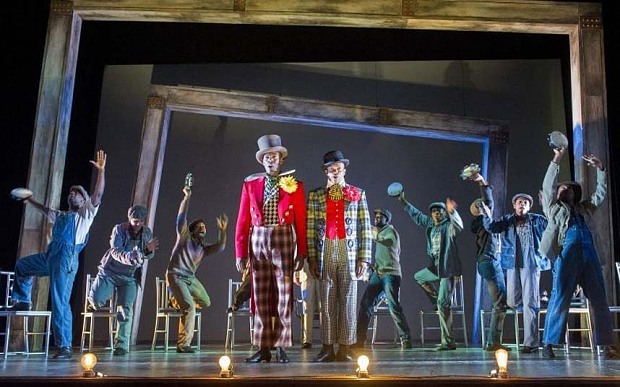 "The show's look is stylishly severe, with a stark, footlighted set that makes resourceful use of simple silver chairs, configured into courtrooms and cells. 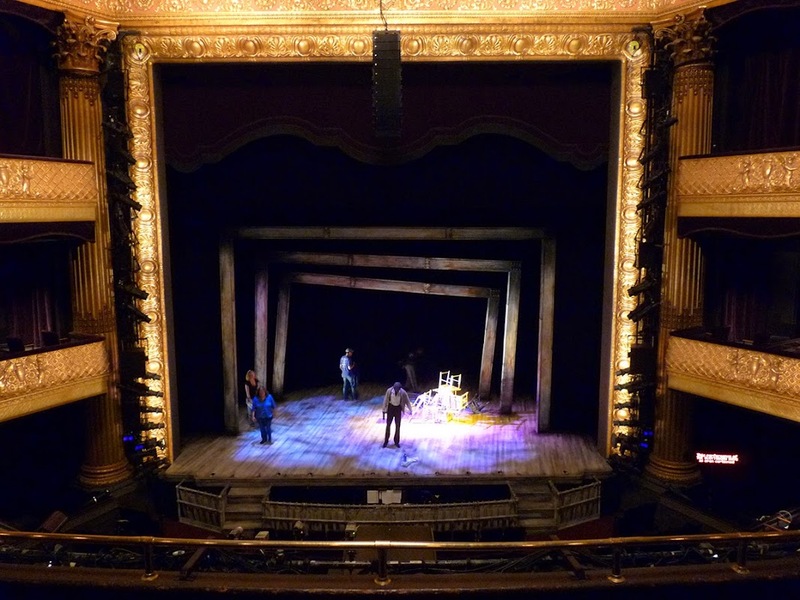 (Beowulf Boritt is the scenic designer.)" "The spareness is matched in the design choices. Beowulf Boritt's set is simply a bunch of chairs and a couple of planks, endlessly regrouped into different shapes to represent everything from a boxcar to a prison cell to a courtroom with brisk efficiency." 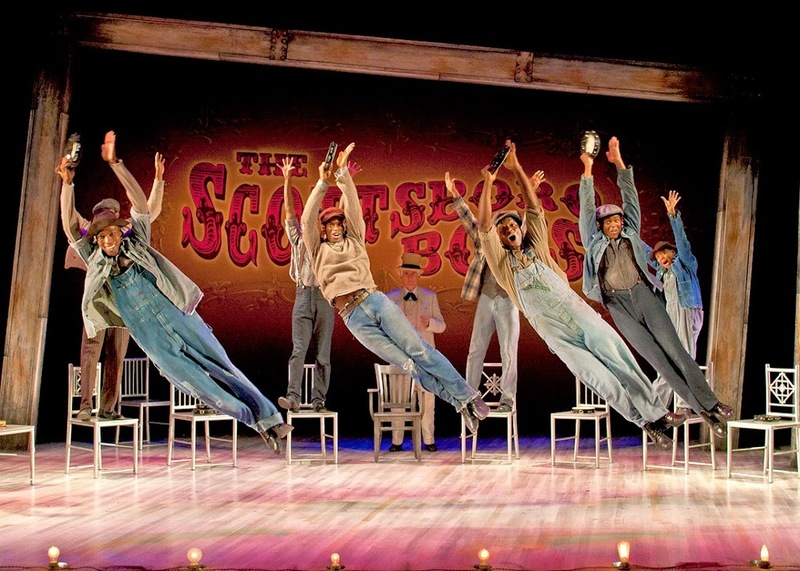 "With little more than ragged costumes, a handful of straight-back chairs and a few planks and curtains (the minimalist costumes and set are by Toni-Leslie James and Beowulf Boritt, respectively), Stroman fills the tiny Vineyard stage with razor-sharp vaudeville dancing." 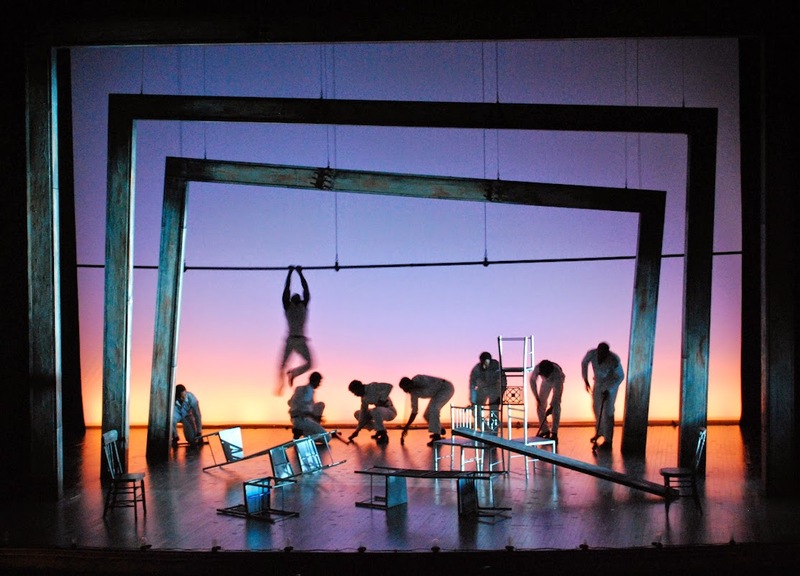 "The production, guided with elegant simplicity by director-choreographer Susan Stroman, unfolds with rapid fluidity on a stage that scenic designer Beowulf Boritt outfits with a dozen chairs and a few boards, which are inventively rearranged to represent a variety of locations." "...Beowulf Boritt's dexterous set (who knew 13 chairs could be so versatile and effective?)" "The set designer, Beowulf Boritt, desrves special mention for creativity. With only planks of wood and steel-backed chairs, he could arrange the items so they became the minstrel setting, jail cells, the boxcar, the courtroom and whatever else was needed"
"Beowulf Boritt's minimalist set (three wooden frames and a tangle of metal chairs)"
"The set (by Beowulf Boritt) is almost unassuming in its simplicity: just a trio of receding frames arching over the stage, each progressively more askew, and beneath them a jumble of aluminum chairs piled to one side. Still, such simplicity also hints at, and soon delivers, rich complexity." "Cleverly and simply designed by Beowulf Boritt."